Ron Freeman “always wanted to be a cowboy,” he says. He grew up hunting, fishing, and trapping, and later even competed in professional rodeos while in college – and currently, he is “living a dream.” He is a “generational rancher from west central Illinois who has been intensely interested in the interconnectedness of nature for many years” and now works on his “habitat restoration project” on 400 acres of Freeman Bros. Ranch just north of town. Most people would view the ranch and not see beyond grass-fed cattle, but Ron Freeman’s stance is that cattle are only a part of the whole. 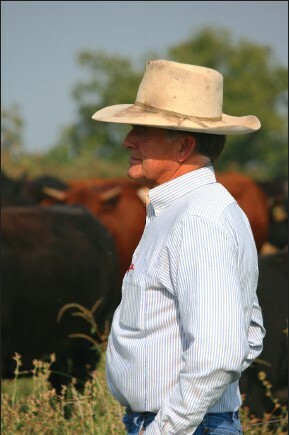 The cattle are, of course, an integral piece of the partnership on the ranch, but they are not the main priority. In fact, there is no priority; every bit of the land, including plant, insect, animal, human, or otherwise is of equal importance. It is a clever thought – “step back and allow nature to work.” These are the ideas of an environmentalist. Freeman is, in his own words, “simply a tool to manage the land.” And why not? So many problems arise when we try to control the variables and allow emotions to dictate our policies. This carries over to ranching, he says. “We believe that nature is our greatest teacher and common sense our greatest guide.” In order to get back to nature, Freeman Bros. Ranch has eliminated all the inputs, such as herbicides, pesticides, common fertilizers, vaccination regimens, grain-based feeds, and feed supplements. Mother Nature personally provides a well-balanced and sustainable infrastructure. The underlying foundation for organizing the pasture ecosystems was actually already there; it just needed some cleanup. So, “over the last 30 years, [Freeman has] gravitated from the traditional cattle production to the belief that nature holds the key to efficient, profitable and safe beef production.” Visiting with Freeman on his ranch, it was extraordinary for me to listen, see, and then, begin to understand his direction. These organically-raised cattle easily graze year-round with holistic ranching. Freeman’s 400 acres are divided into 80 pastures. The cattle will intensively graze a pasture for a short time and then Freeman will move them; by manipulating the grazing habits of the cattle and allowing rest for a pasture, the cattle act as a restorative tool for the pastures. Again, it is a complete system that all works together. After spending an afternoon out at Freeman Bros. Ranch, I felt enlightened and was coming to understand that Ron Freeman’s outlook about ranching made sense. I had learned so much and Freeman reminded me that most ideas, basic tools, and education are right in front of us. “There is always a lesson the environment and ecosystems can teach you,” he says. In the wintertime, he writes on the inside of his gloves “Look. Listen. Learn.” The lessons are there to discover every day. Nevertheless, the ranch is still a business and Freeman has chosen a well-balanced ecosystem with cattle to ensure quality CCOF Certified Organic beef. “Freeman Bros. Ranching provides ground beef and choice cuts to consumers seeking high quality, all natural beef products in Central Illinois.” For the health conscious, the grass-fed beef is the way to go. I am lining up some jerky for myself. If you would like to contact Ron Freeman about ordering, consulting, questions, or inquiries otherwise, you may contact them on the website listed above, by email at info@freemanbrosranching.com, or on Facebook. I sure “like” what they do.